Chrysalis is a live interactive environment from the series of Inflatable Architectures by Chico MacMurtrie / Amorphic Robot Works. 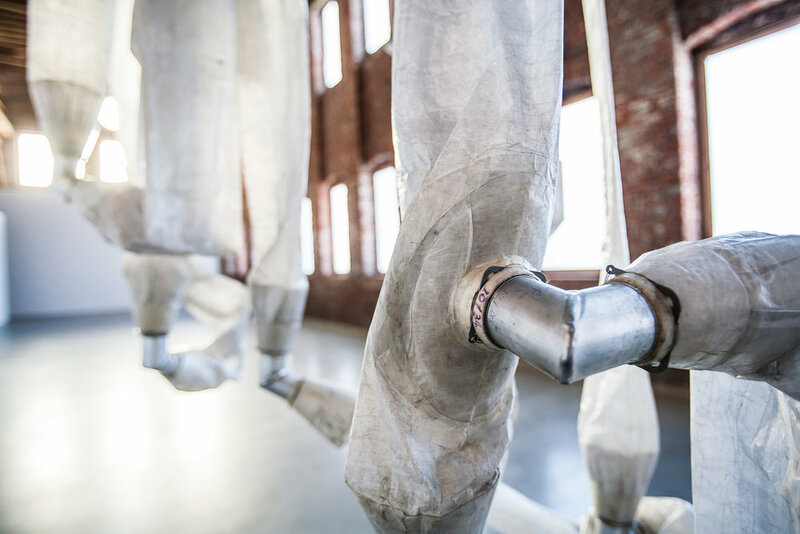 Chrysalis is composed of 100 inter-connected high tensile fabric tubes that form, when fully inflated, a 40 foot long, 26 foot wide and 16-foot high architectural space, evocative of crystal formations. 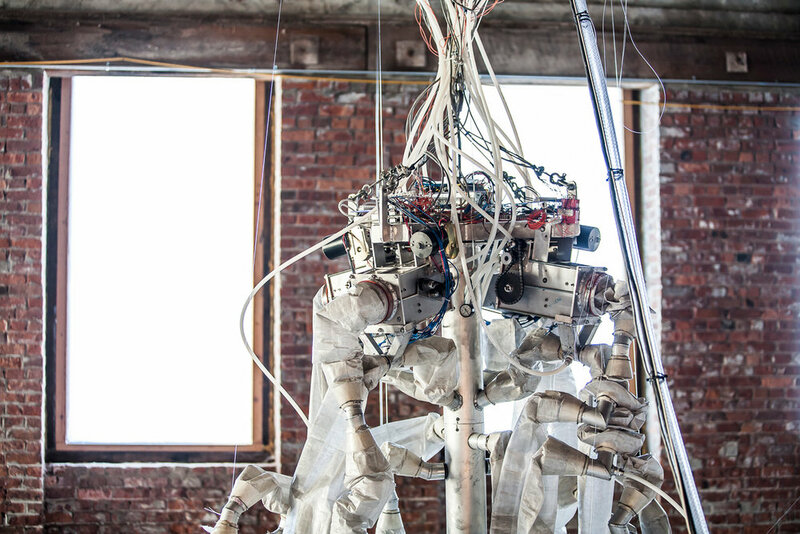 The tubes are networked into 16 live sections and animated by compressed air via a servo-controlled computer system. As the air is released out of the fabric, Chrysalis gently collapses into an organic shape. Inspired by the architecture of the human body on a molecular level, Chrysalis provides a direct, visceral experience of the minute geometric constructions that underlie all of life. Chrysalis resonates with audience interaction on different levels; as a visitor is approaching, Chrysalis responds by opening one or a combination of several sections or by creating a portal that invites him or her inside. Chrysalis also functions as a temporary architecture that performs independently from audience interaction by drawing from previously recorded software sequences. These sequences regulate the amount of air flowing in and out of the fabric tubes, creating a muscle and bone dynamic capable of expanding and retracting, lifting and lowering, and collapsing movements. In its transition from an organic to a geometric state, Chrysalis is best appreciated from inside of the sculpture. The magnitude of the sculpture in relation to the size of the human body engages the audience in a transformative experience as they face and interact with their own biology on an inverted scale. Chrysalis, with its ever-changing geometry, manifests the hidden organic life that inspires and informs all man-made systems. The production of Chrysalis has been facilitated by the generous donation of the high tensile strength CTF3 fabric and technological support by Cubic Tech, Mesa, Arizona. Additional support comes from Robert and Estellean Wick and The Andy Warhol Foundation for the Visual Arts.